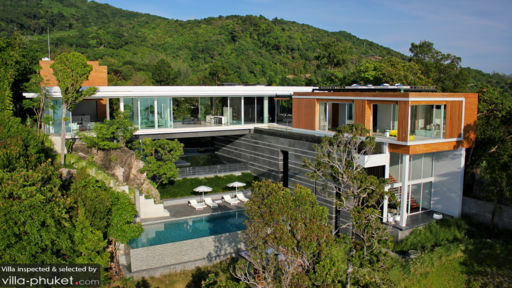 A beautiful modern home on Kamala’s Millionaire’s Mile, Villa Mayavee is a home unlike any other featuring state of the art architecture by Tierra Design, modern amenities in abundance, stunning views of the Andaman Sea, and convenient location for all of Phuket’s exciting sights and places. The four-bedroom home is divided into the master wing and the guest wing which are connected via a suspended lounge. A gorgeous swimming pool sits majestically against an even better foreground, while lush foliage frames the scene. The perfect home for your holiday, Villa Mayavee reels you in right from the get-go. Villa Mayavee is a distinctly-designed modern space which offers utmost comfort and luxury to guests. The villa’s four, air-conditioned bedrooms have been divided into the master wing on the main level and the guest wing on the upper level. The master wing is itself a self-sufficient villa with access to a 15-metre lap pool with ocean views, private terrace lounge, a sitting area for three, and other modern amenities. The bedroom is designed with large glass windows overlooking splendid panoramas and furnished with a king-sized bed. Of the three guest bedrooms, the master bedroom is most spacious with a king bed, balcony, and amenities such as TV, air-conditioning, and en-suite bathroom with Jacuzzi. The other two bedrooms are equally well-furnished with a king bed and singles, en-suite bathrooms, and modern conveniences. Since the villa is surrounded by a rainforest, it already elevates the outdoor experience that you get unhindered while relaxing by the 21-metre swimming pool. Right on the sun lounge which is housed under a pergola roof, you can rest and take nap or enjoy a few drinks. Soak on the sunbeds to get working on your holiday tan or enjoy the view while immersed in the cool waters of the infinity pool. There is a bar with seating that you can head to grab a few drinks with your friends and family. 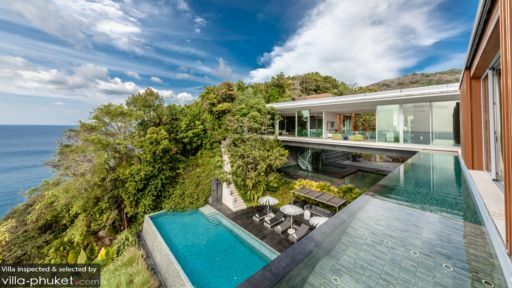 Each aspect of the villa is unique and showcases excellent mastery over design with eccentric spiral staircases, geometric linear structures, numerous lounges, and an unexpected blend of Asian-inspired décor. The living areas are many and more, each one fitted with comfortable seating including an air-conditioned lounge, the bar that is fitted with BOSE speakers, or the suspended lounge from where you get the most beautiful and spectacular views of the sea. The neutral colours, wooden and other natural materials used in the villa, and minimal décor add a charmed elegance to the entire space. You also have access to a modern American-style kitchen which has been equipped with first-class appliances including a microwave/ oven, an espresso machine, dishwasher, blender, fridge, etc. There is a perfectly useful dining area for guests to relish a delicious meal against an even more beautiful background. The living areas are also adjoined to a powder room and restroom for your convenience. If you wish, you can fire up the grill and enjoy a barbecue. The villa is privately owned thus, provides world-class amenities and services to its guests including personal guest assistance to cater to all your needs and requirements. You can request for plenty of services such as meal preparation, airport transfers, in-villa massages, etc. 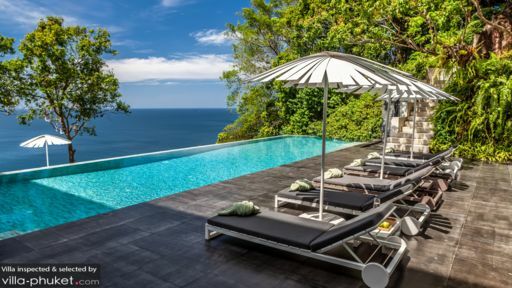 The villa is located on Waterfall Bay, a most beautiful and serene location in all of Phuket where you’ll find other five-star resorts that are cropping along the coastline. Near to both Kamala beach and Surin beach, the powdery white sand and turquoise waters of the ocean are never too far from you.